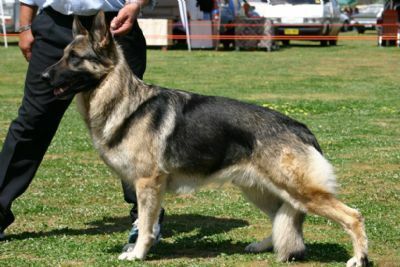 "Rikki" is one of the few sable shepherds that carries the honour of being a grand champion. He is the product of years of careful breeding and selection and is a large part of what I believe to be the correct type and structure and temperament for this breed. 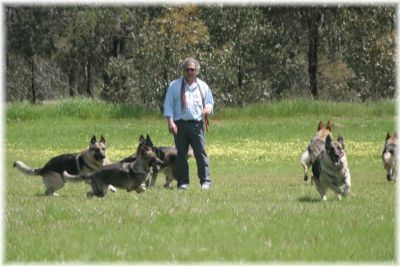 Rikki is gone now but leaves an amazing legacy in his offspring, and for future generations of Gipfel German Shepherds. He was a great show dog, an amazing producer and most important of all, a fantastic friend. He is greatly missed. The care and condition of my dogs is paramount to me. Orders are taken, and placed on my books, as I do not breed for the sake of sales, and I am not a COMMERCIAL BREEDER. The dedicated "puppy families" come back to me time and again for their companions, and I strive to give them a happy, healthy puppy, who will grow to old age with grace and contentment. I love the breed and pride myself with continually breeding sound and secure companions and show dogs. I select compatible bloodlines, and do not simply breed with the flavour of the month Show winners. MY DOGS ARE MY FAMILY..and I do not "kennel" my family..they run free in my secured "home yards", and have free access to the doors of my home. 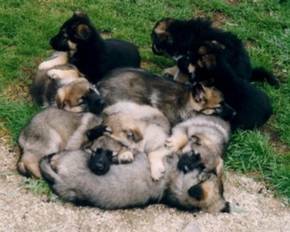 In the pages of this site you will see some of the wonderful companions from across the years and some information about our beloved Breed THE GERMAN SHEPHERD DOG.